i just took my first cold shower in a long time, trying anything to escape the heat. acting on julie's advice, i started off lukewarm, then slowly built my way down to colder temperatures. still, it wasn't freezing water, i probably had it at 70% cold 30% hot, although not bad for my first cold shower. i'm also doing it because i am sunburnt, my back and upper chest region completely red. getting splashed with hot water was like getting scalded with acid, and toweling off was like rubbing myself with sand paper. i see this all as a badge of honor though, i must be having some sort of fun if i'm to be all sunburnt. when i'm all healed, i'm going to have a very natural tan. spending half a day at walden pond in concord will certainly do that. julie came to pick me up at my house in belmont in the julie-mobile at 9:30am. she actually arrived too early and went to get some snacks before coming back again at the appointed time. we took route 2 to walden pond, where already it was starting to get crowded, people coming early to grab a parking spot. get to walden pond earlier enough and you don't have to pay the "donation" aka parking fee since the guard isn't on duty yet, which was exactly what happened this morning. julie pulled her car into a shady spot and we walked around the perimeter of the pond looking for a good place to settle down. walden pond today was a lot different than when we came last year. due to this season's drought, the water level was very low and the pond was edged with exposed beaches, beaches that weren't there before. this was good news for us because instead of huddling along stone steps, jostling for positions, we had the whole perimeter of the pond to enjoy. we found a sunny spot, dropped our stuff, and julie quickly took off her clothes and jumped into the water in her bathing suit. i was more deliberate, more hesitant, as removed t-shirt and shoes and slowly edged into the water. cold! but it wasn't really, once i submerged to my neck, the water was perfect. julie had a theory that guys had a harder time adjusting to the cold, which included ponds and showers, because of our boys. and girls feel cold more often because of those things. julie did a little swimming while i basically walked around the shallow edge of the pond, unable to get any deeper because i can't swim. julie tried to show me the basic water treading movements but i couldn't do them, at least not in a synchronized manner that would keep me afloat vertically. admist all the hub bub we noticed a dead fish floating in the water. not just any dead fish, but a large dead fish. julie picked it up out of the water and onto shore. we dug a hole with sticks (her stick was much better than mine, i had a faulty one that didn't dig very much) and she picked up the dead fish with some twigs (it was too slimy to pick up by hand) and put it into the grave, where we buried it. then, following some sense of duty to give the fish a proper christian funeral, julie erected a cross fashioned out of two sticks and tied together with a piece of rope made from a plant stem. the headstone was made from a large round rock, a nice fish mosiac was created with small pebbles and "colored" with white sand, and a perimeter was created with bigger rocks. we both agreed that designing animal graves was her true calling in life, and her handiwork attracted the attention of two women who were leaving who saw the grave. i informed julie that we had no idea what religion the fish was, that it could very well be a buddhist fish, or maybe a fish that believed in its own pagan religion. by then it was already too late to make a nondemoninational grave, and besides, she made such a pretty cross, we can just assume that it was a christian fish. since i figured i wouldn't be going too deep into the water, i waded around the pond with my digital camera, taking photos, which is what i like to do. julie was quite a sport about it, and even engaged in some very photoworthy antics, like diving off of a partially submerged rock. she did it twice, first time captured on film, the second time undocumented, but perhaps the more interesting jump because her bottom slipped off (i didn't see it though). in between cooling off in the water, we'd get back on dry land to sit on our towels and to take in the sun. julie brought some coppertone spray-on sunblock, which i used but i still got sunburnt because i didn't cover everywhere and some of it would get washed off everytime i went into the water. i brought a cold drink, but because i left it outside, it quickly warmed up and became undrinkable. i also brought some chocolate, which at the time seemed like a good idea, but they quickly melted in my black backpack and i had to hide it underneath my white towel in order to keep it from becoming completely liquid. julie took some time to read her new yorker magazine while i went around taking photos of insects and flowers. at some point we also used up the remaining exposures on my disposable underwater camera that i got three years ago in cancun and still haven't developed them. we took underwater portraits of ourselves and photos of the bland looking fishies that swam around our feet. and finally, we found this big bug (size of a grasshopper) in the water which i thought was a dragonfly nymph (i'm pretty sure of it now). julie picked it up with a stick and dropped it in the woods. i told her she was essentially giving that bug a death sentence, but it was a water bug, not a land bug. 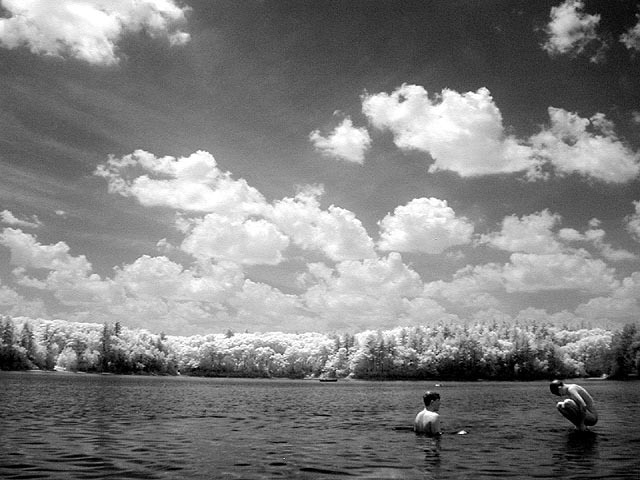 on such a sunny day it was perfect condition for infrared photography, with the pond and the sky and the white clouds. when we were first there, there was hardly any clouds, and the air was amazingly still, hardly a breeze. later, more and more white puffy clouds started rolling in, which julie told me were signs that a possible thunderstorm might be heading our way if the clouds got any bigger. we left at 1pm, but i could've stayed the whole day, if it weren't for the fact that i had to be back in cambridge to wait for the at&t services person to come and hook up my condo with cable/cablemodem/phone. coming out of the woods and back to the parking lot, we visited the thoreau shack which included a life-sized bronze statue of thoreau. i don't know who told me this (dan paquin?) but i heard that thoreau actually wasn't that self-sufficient, and when he left his shack during the way, his butler would come to his place, clean everything up, and leave food for him. i told julie this revelation and she wanted to find out for herself. the display outside the thoreau shack naturally said nothing about his secret manservant. before heading back to civilization, julie took me to a local place in lincoln that makes good sandwiches, the whistle stop. i ordered the "blue line" which was roast beef with onions and lots of blue cheese. the place was air conditioned and it felt so good after being out in the sun all day and riding in a hot car. we got our orders to go and headed back to cambridge. back at my condo, my father was there doing some electrician work. i was pleasantly surprised to see that the cable guy had already dropped by, the television was on, broadcasting some channel i've never seen before, alongside an unassuming cablemodem. the phone line was also working. i felt so connected to the world again! i gave julie the quick tour, then we ate lunch outside on the deck. she said the deck was the best part of the house (space for sleeping, double hand rest, shady, view of the sky), as well as the manual doorbell out by the front door. julie marks the 9th visitor to my humble abode. after both julie and my father left, i got the cablemodem up and running (there was a mini-crisis when i first hooked it up, the hardware address of my ibook's ethernet connection wasn't in the dhcp server database, so i couldn't connect, but after i called tech support, they cleared up the problem and registered me). i sat by the bay window in front of the living room, television on, pepsi in hand, and i aimed manny and amanda, both happened to be online. sitting by the bay window affords me a really good view of everything that goes down on the three streets that intersection where i live. my father came back, and soon afterwards zuka my contractor showed up to take another look at the place and give me an estimate of the amount of work that needs to be done and how much it'd cost. but finally i can honestly say that work will be started on monday, and with fingers crossed, in about a week, the fixes will be done and i can hopefully start painting, even though zuka said he and his crew would be more than happy to paint as well (provided i pay them of course!). later, i went with my father to the watertown home depot and microcenter in cambridge to buy some home networking equipment and supplies. finally, it feels totally great, but i went the whole day wearing my swimming trunks. they're light, they're stylish, and i don't need underwear, which is totally liberating. it's kind of risque too because i have to watch how i sit otherwise i'll reveal too much! i think i might've found my new summer look.